As i departed work on this gloomy, rainy Montreal evening, it dawned on me that tonight would be the perfect night to fill my cozy apartment with the warm smell of chocolate chip cookies, stuff my face with said cookies, curl up on my couch and lose myself in Season 3 of my new obsession du jour; Battlestar Galactica. However, not one to eat sweets before a proper meal, i decided to whip up a batch of one of my favorite “Mommy makes it better” dishes; spaghetti with rapini. Every time i have tried to make this dish, my efforts have always ended in me calling The Suze, whining that my rapini was too soggy, or that my pasta was too hard. I could never get the timing right. Tonight, i was determined to master this simple dish, a dish one might say has been the bane of my culinary existence for 5+ years. As i scoured the vegetable aisles of my local fruit market, all i could see was kale. Rows and rows of kale took up the place where rapini should have been. Now i am no stranger to kale. I have sauteed and chipped kale with the best of them. (I live for kale chips. No joke, i actually do…) In a moment of inspiration, it dawned on me; why not use kale instead of rapini? The flavor is milder, the cooking time might potentially match that of pasta, and the texture is sublime! What can i say, my experiment in substitution turned out a million times better than any spaghetti and rapini dish i have ever tried to make. While kale does not have the same bitter taste i adore from rapini, it has a chewy, leafy texture that rapini does not. It also takes well to being boiled, while rapini sometimes tends to fall apart in the boiling process. Kale is super good for you; it’s packed with loads of anti-oxidants, AND it’s anti-inflammatory! Next time you see a beautiful, lush bunch of kale at the grocery store, pick it up and try this recipe! Enough spaghetti for 2 people – or enough for one supper and one lunch for you, if you live alone like me! Fill a LARGE pot with water, and bring to a boil over high heat. Once the water is boiling, throw in a pinch of salt, the spaghetti and the kale. Keep the heat on high, and boil, stirring VERY frequently. While the spaghetti is cooking, cook the tomatoes. In a frying pan, heat oil over med-high heat. Add garlic, minced, and stir for a minute or 2. Once the garlic is aromatic, add the tomatoes, and lower heat to medium. cook for a few minutes, stirring. Once you see the tomatoes getting a little mushy, lower the heat and add the juice of 1 lemon and the chili flakes. You want your tomatoes to get really mushy, and you want the juices to come out to create the “sauce” for the pasta. Let the tomatoes cook on med-low heat until the pasta is ready. Once the pasta is to your desired texture, turn off heat, strain the pasta and kale, and return it to the large soup pot. Throw in your tomato mixture, and toss to coat all the spaghetti and kale. Add pepper and enjoy! I realize not everyone shares my love and pure excitement for all things vegetable, though i don’t understand why. I’d pick a head of kale over a chocolate chip cookie anyday, but for all those who would go the chocolate chip cookie route, please get in your kitchens and make the following chocolate chip cookie recipe NOW. This recipe kicks all other CC (that’s chocolate chip, for you amateurs) recipes to the curb. 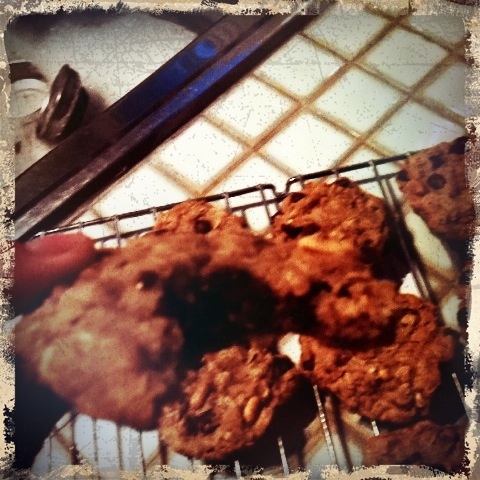 It’s chunky, it’s sweet, it’s got oats and cinamon, and it oozes chocolate. What more could you ever want from a cookie? This recipe comes from Jae Steele’s awesome cookbook “Get It Ripe”. Jae Steele is a Canadian vegan cookbook author who has published 2 excellent books i would highly recommend. “Get It Ripe” was somewhat of my introduction to vegan cooking, and was a sort of Bible for me througout my introduction to veganism. Jae Steele always favors natural sugars and sweeteners, and is very health conscious when it comes to desserts. Her recipes are easy to follow, and her approach is very user-friendly. I recommend her cookbooks to beginner and professional vegans, and carnivores alike, just because she’s awesome! Pour flour, oats, baking powder, baking soda and salt in a large bowl. Mix well. Add chocolate, nuts and cinnamon and mix throughly. Set aside. In a separate bowl, blend oil and sugar until throughly combined. Add applesauce and extract and blend. Pour wet mixture into dry mixture and stir until all flour is absorbed. Form into tablespoon sized balls in your hands and drop on a cookie sheet. (I always line my cookie sheets with parchement paper, it makes for less clean-up!) Flatten balls a little with your fingers, making sure there is ample room between each cookie. I usually cook 6 cookies at a time, to be on the safe side. Bake in the oven for 13 minutes. Once the cookies are ready, take the cookie sheet out of the oven, and let the cookies cool on the sheet for 2 minutes. Transfer to a cooling rack to cool completely. Eat. Share. Give to friends. Spread the cookie love. To all you lucky cats who are scoring yourselves a bag of these babies tomorrow, i hope you love them. And for all you bakers who feel like the recipe makes way too many cookies for your own good, you can freeze the cookies in an airtight baggie, and pull them out to thaw when you get a craving. Which is exactly what i’m doing for my awesome man B’s visit this weekend.